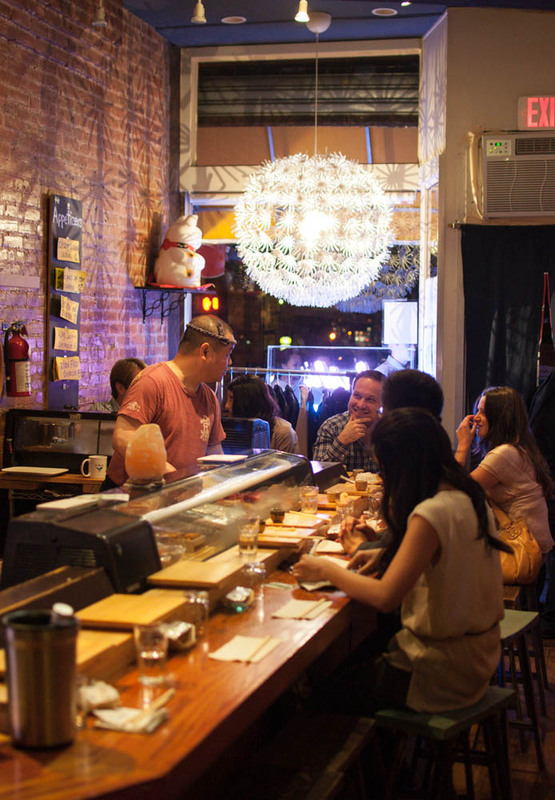 I was told that getting a reservation at Tanoshi Sushi Sake Bar was not going to be an easy task but I was up for a good challenge. It took dialing the same number over 60 times within the span of 30 minutes and some luck for us to get the reservation at Tanoshi in mid September. 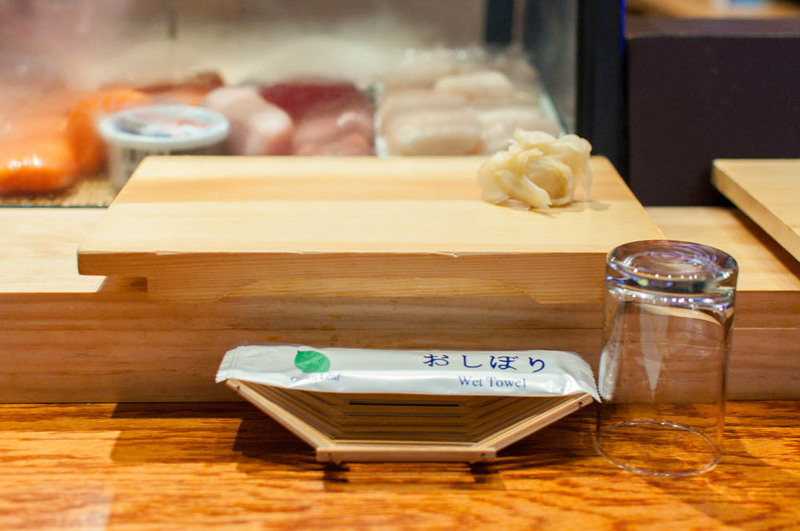 The tiny Upper East Side sushi spot that originally only took same day reservations on a sign up sheet had finally started taking reservations over the phone. However, because of it’s booming popularity, the phone line managed by the chef’s wife was constantly busy. When you finally are able to get through, chances are that all reservations for this tiny 10-person restaurant will have been booked for the next month and half. The only thing you can do is to put yourself on the waitlist and hope, like we did that someone who was fortunate enough to get a reservation has to cancel. The restaurant opened last year in an almost unreachable corner of the Upper East Side on the corner of 73rd street and York avenue, a good 15 minutes walk from the nearest subway stop. 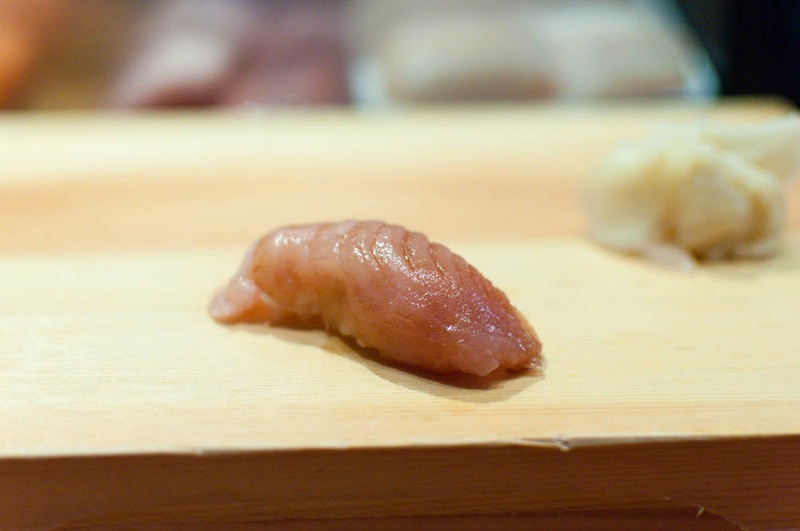 Despite it’s inconvenience, Tanoshi has garnered critical attention for its high quality omakase only sushi served at an almost unbelievable reasonable price. With only 3 seatings each night with 10 seats each round, I can see why the reservations here book up so quickly. We arrived at the Tanoshi for our Saturday night dinner a little early and passed time with other diners in our seating outside of the little store front while the round before us finished up their meal. At 7.30PM promptly, the doors swung open and the curtains parted to lead us inside the restaurant. The restaurant itself was extremely bare bone with no more than a long sushi counter with ten rather uncomfortable stools. The space was so small that there was barely enough space between the seats and wall to pass one person, giving new meaning to a cozy atmosphere. 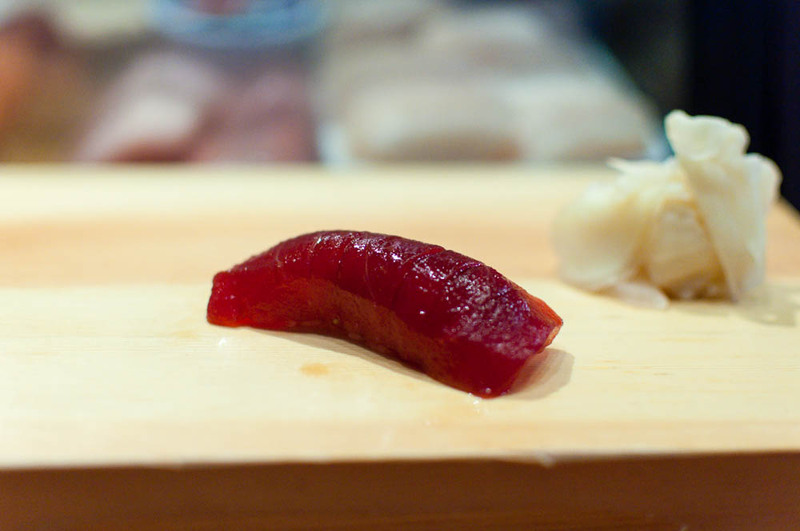 I planted myself square in front of the sushi chef Toshio Oguma, ready to start the journey of his 10 piece omakase. After making sure we didn’t have any allergies or aversions to any particular ingredient, we were all given the opportunity to order some appetizers if desired. 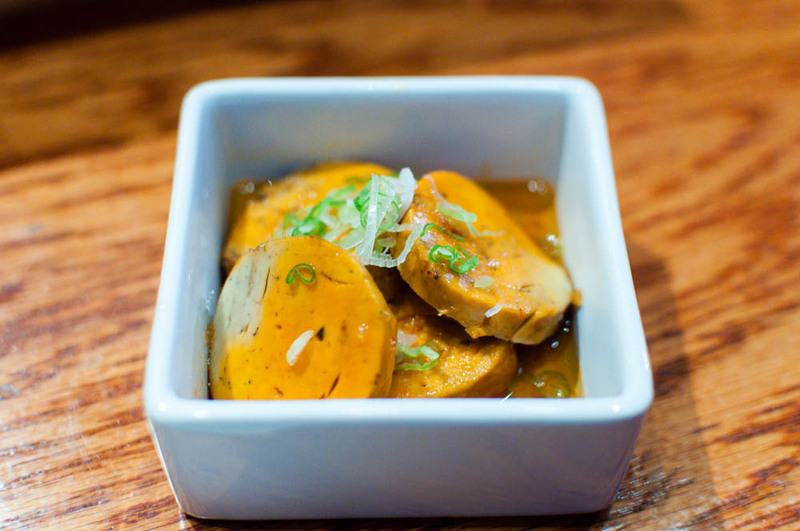 Of course, I go for the most exotic item on the menu, monkfish liver. 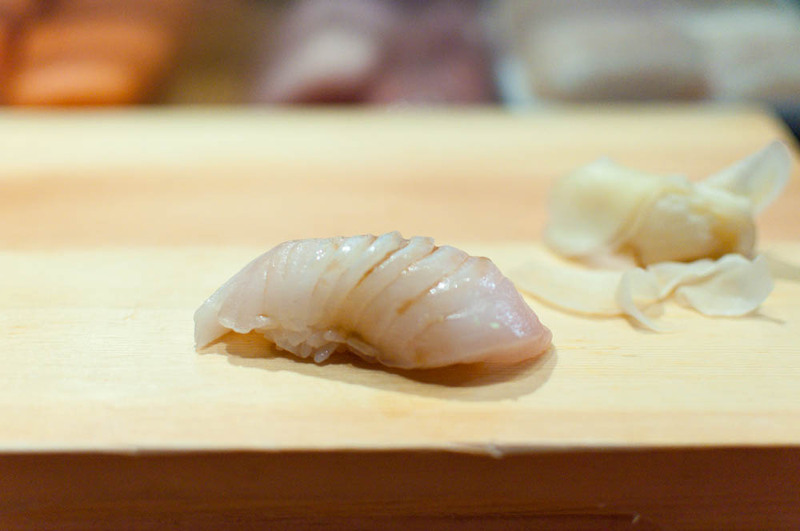 Served with a ponzu sauce, the creamy yet firm pieces of the monkfish liver disappeared as quickly as they appeared, leaving a lovely unctuous feel in the mouth. 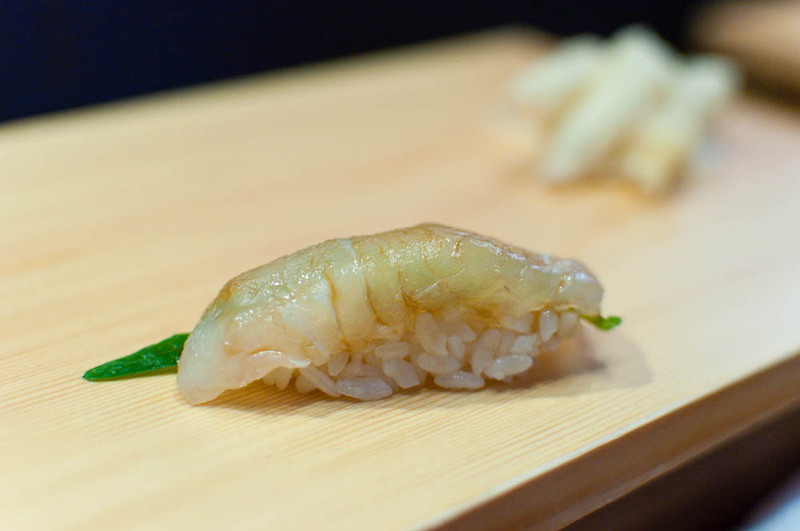 With no further delay, we were ushered into the omakase with a piece yuzu cured fluke with shiso. 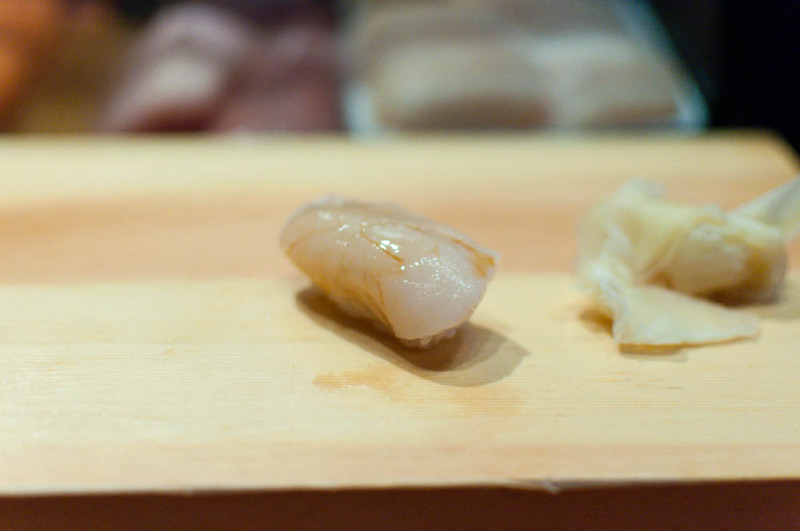 … followed by the sweetest piece of scallop. It was at this point in the meal that the Chef noticed my camera and how I was diligently clicking away every time he set each piece in front of us. He paused for a moment before carefully placing the scallop on my plate. “This is the more beautiful piece. For the camera.” He said softly. 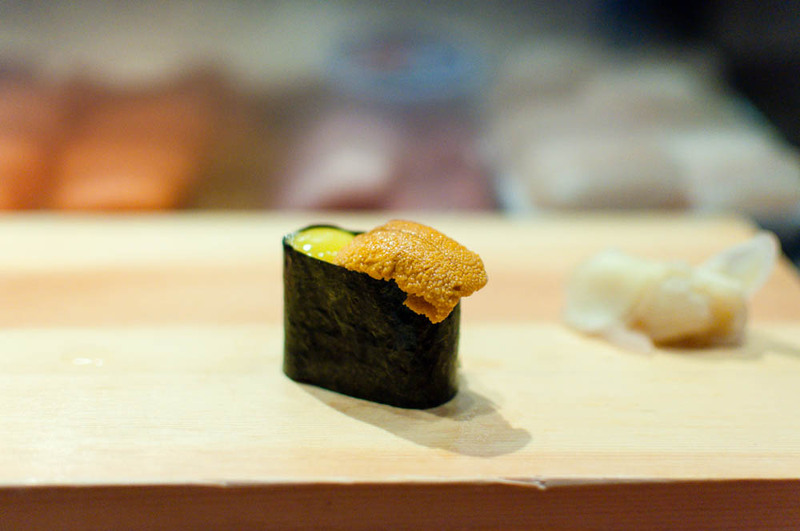 The next piece was one of my favorite bites of the whole meal: a piece of cured black sable fish. 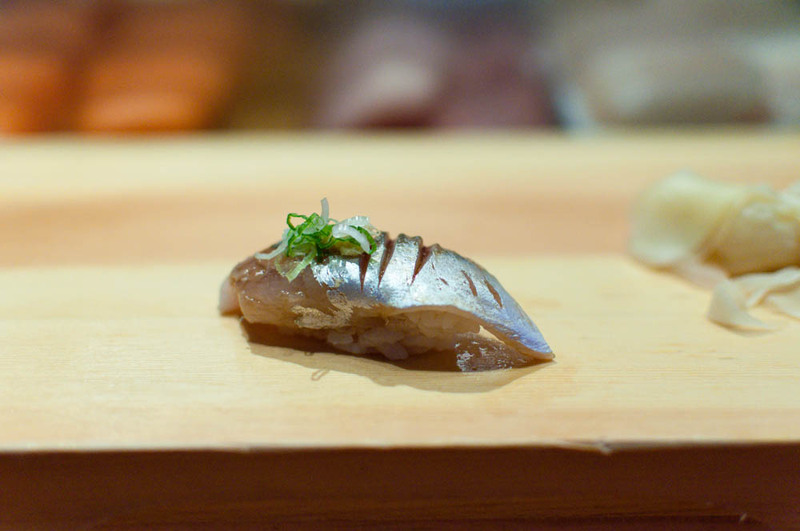 The typically oily fish was buttery with a smokey finish – unbelievably rich. 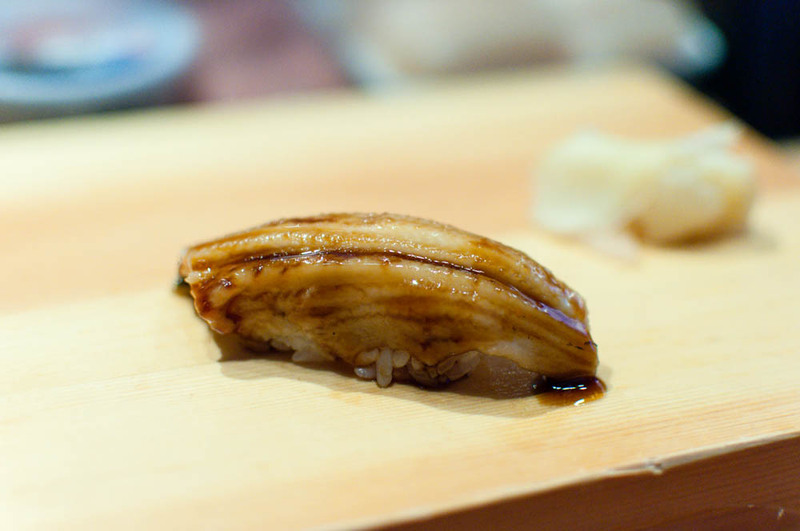 The sea eel came out and stunned all of us with its flavor and that lovely sauce that was painted on by the chef. 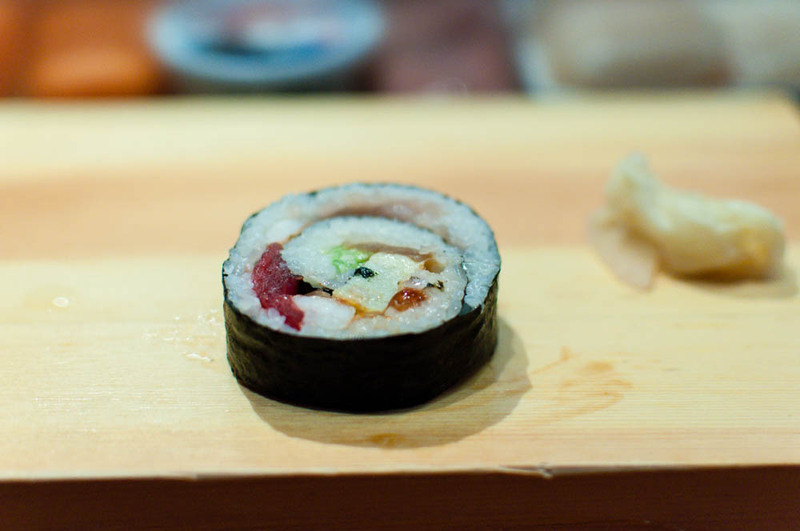 A roll made up of all types of raw fish was just a little too big to stuff in our mouth. We carefully bit off a bite at a time so we don’t accidentally drop a single bit. 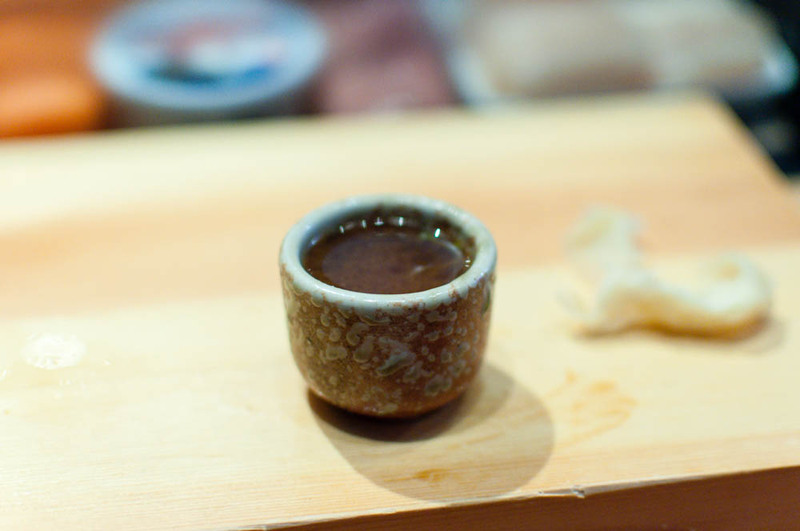 I knew we were nearing the end when a tiny little thimble of miso soup appeared. 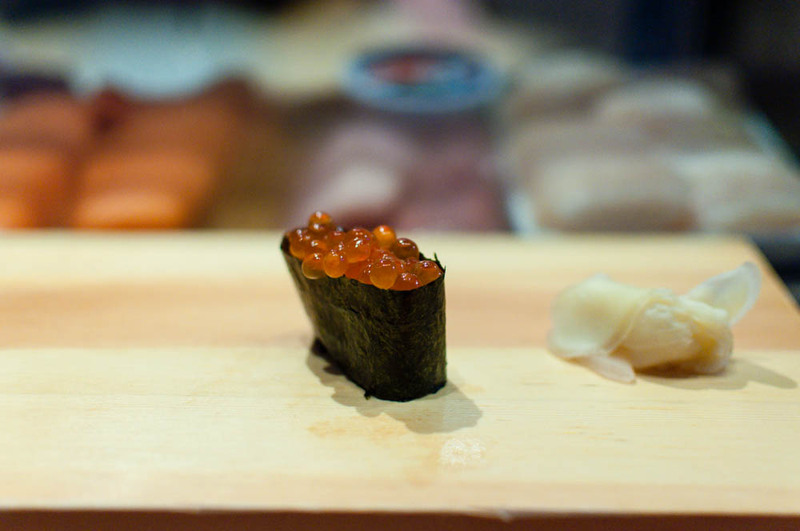 The red miso here was made with fish stock, giving it an incredibly rich flavor and depth. 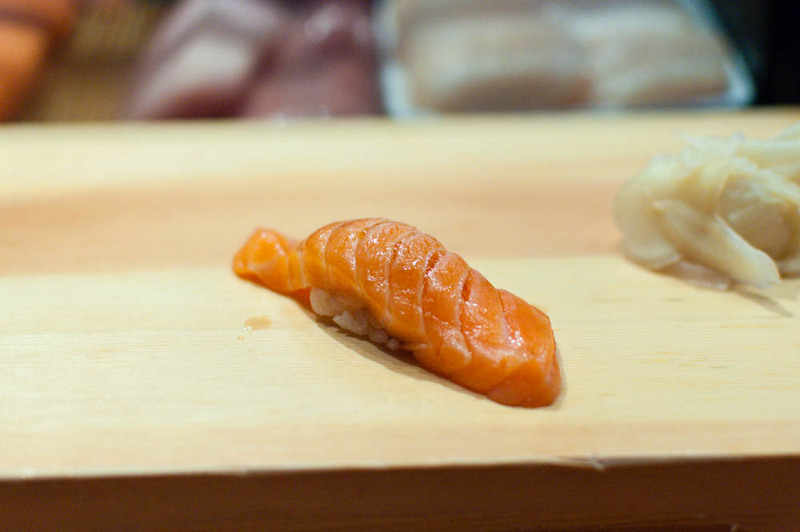 Finally, the last piece of the omakase arrived directly into our hands. 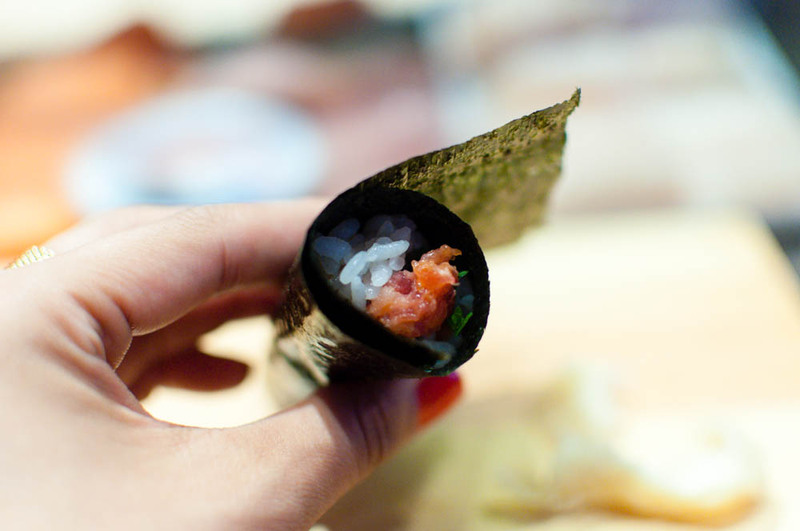 Crisp seaweed lent a great crunch to the spicy tuna and shiso inside. Just the right bite to end the meal. There are no desserts offered at Tanoshi so this was the end of the official meal. We were all welcomed to linger a little longer and order some more pieces a la carte. Feeling like we had just the right amount of food, we gracefully bowed out to let the staff clean up for the next and last seating of the night. What else can make this perfect and simple meal even better? The fact that, as of right now, Tanoshi is still a BYO despite it’s name. So next time, I will be prepared and come with a hand selected sake to go along with each delectable piece of sushi prepared by Chef Toshio Oguma.